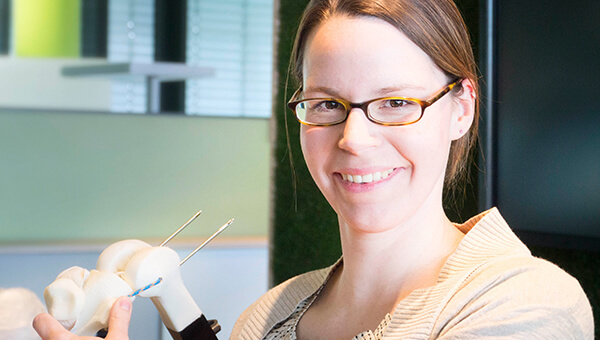 As an Application Specialist within Orthopedics, Sarah has been working for Brainlab since October 2012. One of her favorite parts about coming to work every day is the opportunity to build relationships with her colleagues. Find out more about Sarah’s story below. When did you start working at Brainlab? In October 2012, I attended DKOU (German Congress for Orthopedic and Trauma Surgery) in Berlin and gave a short presentation about my PhD thesis; of course, I also wanted to take the opportunity to learn more about the exhibiting companies and, therefore, potential employers. The orthopedic field has fascinated me since I had several lectures during my studies and I was delighted when one of my future colleagues explained all the orthopedic applications to me. I was encouraged to send my application, as there were several job opportunities. A month later, I got the confirmation for the job as an application specialist for orthopedics. I work in the customer care team which consists of about 20 people, but we are divided into smaller teams for different applications. There are two of us working with orthopedic applications (hip and knee). What do you usually do when you first get into the office? I check my emails to see if a customer or colleague needs our help. How would you describe a regular day as an Application Specialist at Brainlab? There is no regular day for an Application Specialist. We never know in the morning what the day will bring. We support customers and colleagues with clinical and technical issues via phone, email or even onsite. Additionally we give internal and external trainings and prepare and develop our training documents ourselves. Currently, I am working on a new e-learning for TraumaCad, a planning software for orthopedic surgeons. Together with colleagues in the US, we enable Brainlab employees all over the world to learn more about this application without the need to come to Brainlab headquarters in Munich. What is the best aspect of being an Application Specialist at Brainlab? The close cooperation with many different people; we work with physicians, technicians and engineers. I like the challenge of never knowing which problem needs to be fixed within the next few hours. Our international team: We are about 20 people from at least eight different countries. Every day you can dive into another world and learn more about another culture.